Not going to be doing anything to this besides maintenance. Part of the deal was 4 brand new tires, so we should be set to go there. Just hook up the trailer and travel. We did opt for the 1 year 12k mile warranty, just in case. Truck has 133,000 miles and the EGR valve, EGR cooler and oil cooler was replaced at 103k, injectors were done at 99k. Hopefully it should be good! We are picking it up tomorrow during the day (wasn't ready for tonight). Yea traded it in, kind of sad it was a really nice SUV, towed well and was comfy DD as well. 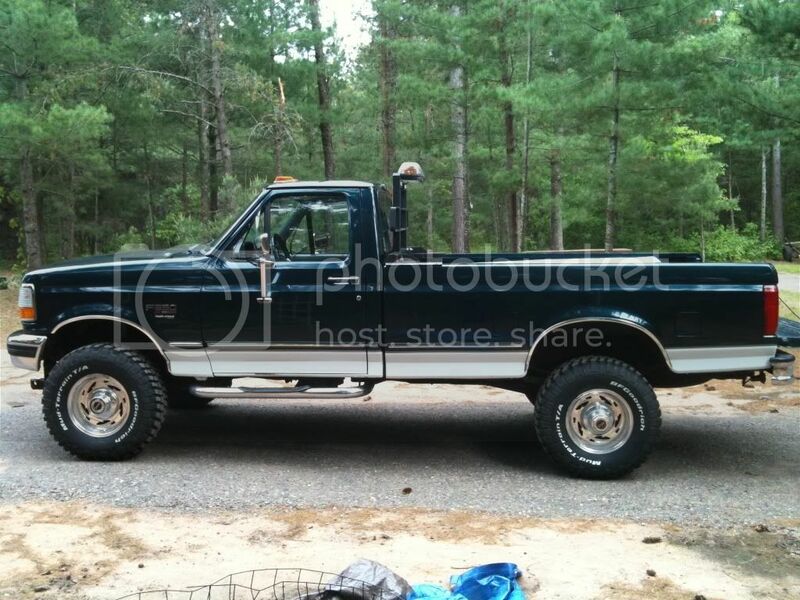 I would just buy a 7.3 and be done... It will pull anything you hook up to it! Had my 2000 with a 30' gooseneck full of hay and it pulled it no problem! Did I mention that I tipped the scales at just shy of 50,000lbs. As long as the previous owner took care of it and you do the same it will be fine. Just be prepared that when things break or wear out its going to cost you some coin. Parts are more expensive, fuel is more expensive (may not be right now but trust me what we are seeing right now is NOT typical) and routine maint is more expensive. Just be sure you do all your homework and make sure you buy a mechanically sound truck. And lets be honest... the older the truck the better they look! I knew some one who had the 7.3 and it seemed to respond pretty well to a flowmaster exhaust. Said his mileage was noticeably better. He won the exhaust in a fishing contest so i don't think he had any reason to lie since he didn't pay for it. Any one else put exhaust on their Fords? Are these yours? Ours looks just like this one, white King Ranch. Did I mention that I tipped the scales at just shy of 50,000lbs. How much is a ticket for being 20,000 to 24,000 lbs overweight? around $15,000 not? Last edited by JSalzl; 06-20-2012 at 07:29 AM. 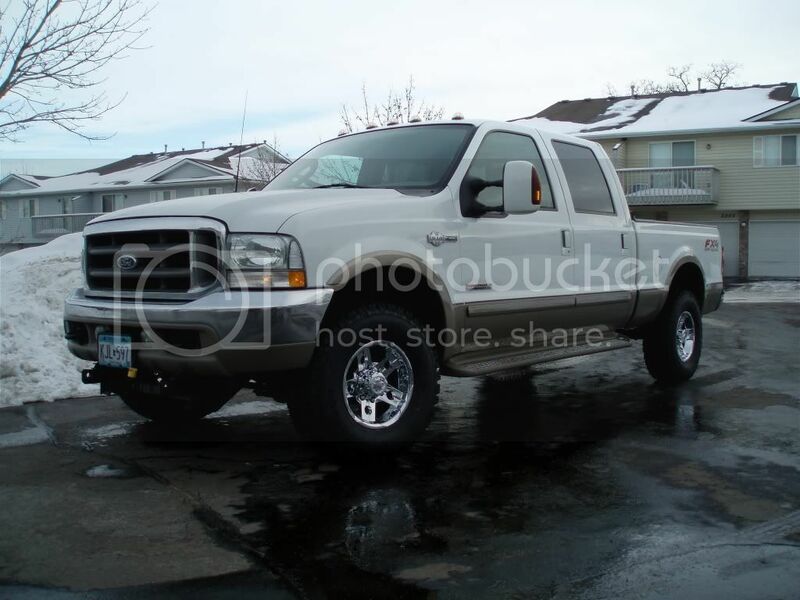 I've got an 04 F250 with the 6.0 and it has so far been quite good to me. Will be taking it across the state tomorrow with a light load, then across country with a bit more. 94k miles, one owner, well maintained, and haven't had a bit of trouble yet. So the A/C didn't blow cold when we test drove it, they said they would recharge the system for us and eat that cost as part of us buying it. They pulled the system and it was full of freeon, turns out the compressor and accumulator were shredded. We are also picking up our trailer tonight (the reason we bought this) so it should be a good test, it's ~40 minutes away so we'll get some preliminary MPG figures while towing. I would be really happy with 13mpg but fully expect 10, trailer is 29' ~7,800 lbs dry. During my test drive I set the cruise @65 on 169 for 5 miles and got 21.5mpg according to the trip computer. You may have just picked up my old truck.... does it have a back rack?!? Did you get one of those "play" trailers? WTF do you need a trailer that big for? Geez. No back rack, must be a similar but different truck! Not sure what a play trailer is, but ours looks like a large travel trailer with a ramp door on back (toy hauler - I assume that's what you are calling a play trailer). Definitely don't need it, just want it. We have been using an 18' toy hauler which is really nice size and economy wise, but with the baby space is just too tight. Add in, while traveling the bikes are loaded into the living area. This new trailer the bikes have their own separate garage. You pretty much have to get into this size to get the separate garage. Well last night they hadn't finished fixing the A/C, so we used our Envoy to pick up the trailer. 9.3mpg on the way home which is better than I thought it would do. Pulled it just fine! We "should" be getting the truck today sometime. 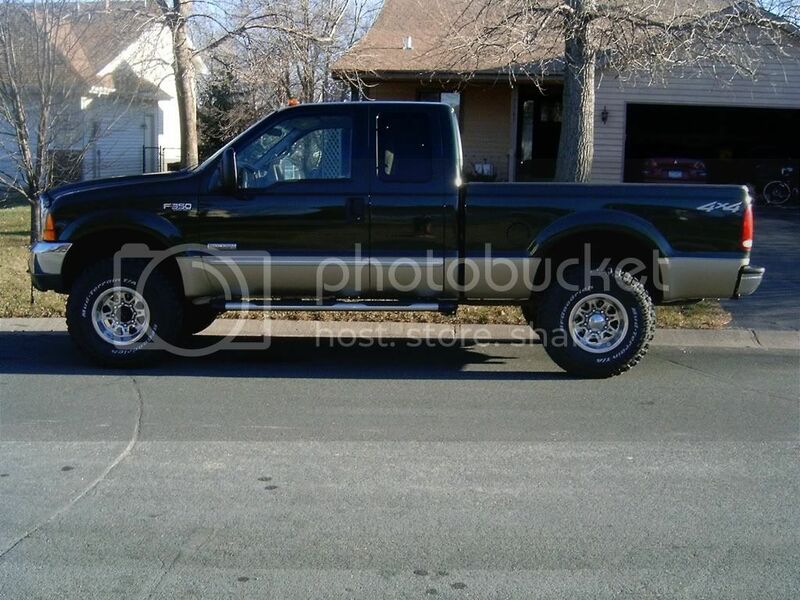 But, either way, any diesel truck is a good buy in my book... Congrats on joining the 3-plus-diesels-in-your-garage club! I'm currently at three as well. Oh i misread haha congrats anyway!